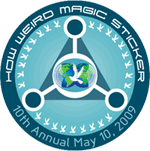 The MAGIC STICKER is your way to support the faire and keep it going. And our way to give something back to you. The faire has become very expensive to produce and relies on you to make it happen. At $10, the faire is an incredible deal, coming out to only $1 a stage for a day of entertainment. Wear a costume, and it's only $5. A tremendous bargain. But you could end up saving many times that amount through discounts and specials. All proceeds go to the non-profit World Peace Through Technology Organization. Continue to check this website for updated information, and a growing list of all the benefits of the MAGIC STICKER. How Weird bars - $1 off every drink! How Weird after parties - $2 off! Trop Mignon - 10% off on select pieces, plus a Magic Bin of $5 goodies! Swankety Swank - 10% off on select pieces. Synergy Clothing - 10% off certain items. Bennetts Beads - A Magic Bin! Plus 10% off of purchase of $150 or more. RocknSocks - 10% off of purchase of $20 or more. Caraucci - 10% off of purchase of $200 or more. Eleven44 - 10% off of purchase of $200 or more. FireDog Designs - 10% off all belts, or any purchase of $100 or more (fire poi excluded). Handmaden Leather - A drawing for $50 gift certificate, and a Magic Bin with items up to 50% off! Elephant Tails - Choose a free Magic Item with the purchase of $45 or more. FurrPlay - Buy a furr hat and shrug, get a set of furr cuffs for free! Buy a furr vest and get 10% off! Buy a furr hat, get a bracelet for free! K-Skin Leathers - A Magic Bin! Plus 10% off large purchases. Omnatura - A Magic Bin! Plus 10% off large purchases. Miss Giggle Monster - 10% off purchases of $150 or more. And free furry mittens with the purchase of any pair of pants! SF House Music & Non-Stop - $2 off all clothing. Bishop & Victorious Glass - 10% off purchase of $125 or more. 20% off purchase of $200 or more. Underground Freelancing Operation - $5 off certain t-shirts, and 20% off certain canvas paintings. Dreamtime Clothing - 10% off all items! A $5 Magic Bin! And a Magic Discount Rack! Crystal Tara - 10% off any order of $80.00 or more. 15% off any order of $200.00 or more. 30-50% off discontinued t-shirt items. Henna Body Art Designs - Small designs ($10) with $2 off. Large designs ($20 and up) with $5 off! Wild on the Inside - Free Faux Fur gift with any purchase over $25. $10 off Faux Fur Vests. $25 off Faux Fur Coats! Zipcar - Spin a Magic Wheel for prizes, including a free day reservation. Juicy Lucy's - A one-minute Reiki Rejuvenation with juice purchase! Oli's Cannoli's - One free topping! 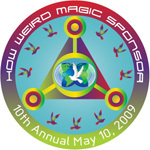 Magic Stickers are only available at the four entrances to the How Weird Street Faire between Noon and 6pm. Thanks to our generous and magical sponsors. Please support them for supporting the faire! And thanks to Kourosh Gorji for the sticker design.